Amazon has its own courier company (called Amazon Logistics), but it doesn’t offer the kind of service you may have been used to. Especially with high value items, as I recently found out. And it doesn’t appear to be a one-off (or two-off) case either, as many customers have been complaining about the poor service. Back in May, I pre-ordered a PS4 pretty soon after Amazon UK first listed the consoles online. I was later excited to learn that my console would be arriving on launch day – November 29th 2013, thanks to Sony guaranteeing stock for pre-orders before August. When Sony revealed upgrades to bundles packages, I opted for the PS4 Mega Pack offered by Amazon, upgrading my order effortlessly. The Mega Pack included the Player Edition of the PS4 (containing the console, two DualShock 4 controllers, the PlayStation Camera and Killzone: Shadow Fall), and FIFA 14. Closer to launch date, Amazon emailed me to say that the console had been despatched, and confirmed launch day delivery at no extra cost. However, come launch day, Amazon Logistics (the courier company tasked to deliver the console) didn’t show up. After contacting Customer Service, I was assured that the console would arrive as they deliver until 9pm. After already waiting at home for the better part of the day, I had to wait a further few hours in the evening too, to no avail. The console didn’t turn up. Even now (Dec 30 2013), Amazon hasn’t updated the order page to say it was lost / canceled. After contacting Amazon over the next few days, I eventually learned that the package has been lost at the depot and never even made it onto the delivery van. It took Amazon around 4 days to get their courier company to tell them this, and only after I repeatedly contacted them on a daily basis. Amazon then refunded my original order and played a new order for the same bundle when it was in stock again. At least I received a refund fairly quickly, but I was still disappointed that I didn’t get the PS4 on launch day like it was promised. About a week later the new order was placed and estimated to arrive between December 19 2013 and December 21 2013. I later got an email to say that the PS4 would be delivered on December 14 2013 – ahead of schedule, and this time, the PS4 was loaded onto a delivery van unlike the previous order. 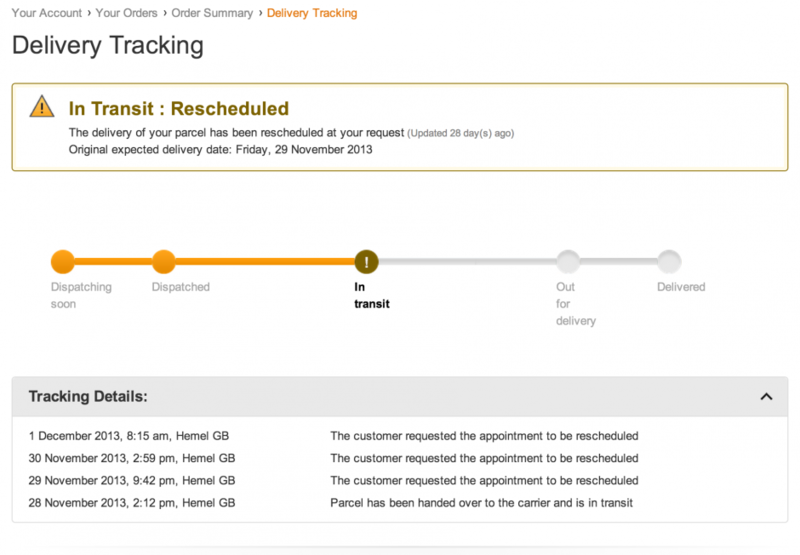 I waited until 6pm but the delivery didn’t turn up – wasting another day like last time. However, this time when I went to track the package, I noticed that the Amazon Order page has been updated to say the PS4 was delivered at 4pm. I was home the whole, in view of the front door, but no one has even parked up outside my house let alone attempted delivery. I would expect the courier to take a signature when delivering the item so I assumed a neighbour must have picked it up. I check with both but neither of them has accepted any deliveries. I contact Amazon Customer Services letting them know that the package has been updated to indicate it had been delivered but it hasn’t actually arrived. I had to wait 24 hours before expecting a reply. After 48 hours I still hadn’t heard anything back, so I contacted Amazon again, who then contacted the courier. A day later, the local Amazon Logistics delivery guy stopped by my house to investigate. He told be that he usually deliveries to the area, but he didn’t remember ever stopping by my house before. He said he would never leave a package outside the house and would always get someone to sign for it. He later ran his boss to see if it would be at the depot, but I told him that the tracking information said that the PS4 has been loaded to a delivery van. The following day, the Amazon Order Page said that the package has been signed for, but to my confusion, it said it has been signed by me. I asked Amazon to investigate further, and provide proof that it has been signed for by me. Eventually, Amazon couldn’t actually provide proof (as it wasn’t actually delivered or signed for) and gave me another refund. Amazon says the package was delivered when it wasn’t, and even said it was signed for by me, when it wasn’t. I decided not to order from Amazon again and was lucky enough to pick up a PS4 at my local Argos when it was back in stock. The Amazon Forums are full of comments with similar experiences to mine. It doesn’t look like its a small issue either, with over 1000 posts dating back to May 2013 by over 460 people. Many comments refer to undelivered Christmas presents and delivery drivers indicating a delivery attempt was made without actually making one! Have you had a similar experience with Amazon Logistics? Tell us about it in the comments section below. I have had two issues of drivers from Amazon claiming to have attempted delivery of goods, when they hadn’t. There doesn’t seem to be any real interest from Amazon. Customer Services were very sympathetic, but could only offer me a one month extension to my Prime membership. I have declined the offer, cancelled my subscription to Prime and I will not buy from Amazon again. Yes, I think that is a common theme. The depots apparently have so many parcels to deliver that they scan them as outgoing and then immediately scan them back in as undelivered so they can actually deliver them the day after. But I’ve heard cases where this goes on for a number of days. Either way, its completely unacceptable. I have had the same problem. I purchased a kindle fire HD. My account stated it was delivered but I never recieved the item. Amazon were quick to dispatch another kindle but in the mean time I was left wondering if they had sent it to the wrong address, if my details were compromised as they link the kindle with your account. I live in a flat but i have ordered many items from various companies without a problem. Amazon really need to investigate the system in place as to why these things are allowed to happen as I for one will be reluctant to make expensive purchases from Amazon if Amazon logistics are the courriers. Not City Sprint doing the actual delivery by any chance was it? Amazon Logistics seem to subcontract out to the same lousy couriers they used before, just under a different name. Unfortunately in my case that means City Sprint, who manage to make even Yodel look good. One the first ‘try’ they claimed they’d tried to deliver and left a card; a blatant lie as I was in and not more than 10 yards from the bell all day, and there was no card. So I rearranged, and the same thing happened. After the third attempt was simply a repeat of the other two, I gave up and the parcel was sent back. On two other orders they were assigned as courier, and once again they lied about trying to deliver and leaving a card, but on these two occasions I didn’t waste my time with ‘rearranging’ the delivery, and was simply refunded. It may look like a great saving to Amazon to scrape the barrel for cut price deliveries, but it isn’t really as I haven’t used them once in the last year, costing them a couple of thousand pounds in lost business. I use Ebuyer a good deal more now, and they tend to use DPD, who in my experience are brilliant, or Royal Mail, who are still OK if its not urgent – there are actually plenty of online stores who can equal Amazon on most prices, and most will beat them on customer service. Amazons deliveries have been an absolute debacle of continual deterioration for the last 5 years its time more people voted with their wallets, because they’re not going to change otherwise. For me, it was a company based in Milton Keynes called APLE. The company looks to be working exclusively for Amazon as all the information on the website include Amazon details. It looks like a lot of customers have been experiencing similar situations, and it looks like the list keeps growing. “Ghost” deliveries seem to be the most common problem, but Amazon doesn’t appear to be doing anything about it. I’m 99 percent sure APLE was the one firm Amazon actually bought outright when it announced it was starting Amazon Logistics a year or so ago, although frustratingly, I can’t find the news story any more. I think prior to the purchase they had a lousy reputation. If you want an idea of the sheer scale of the complaints, check out some of the threads on Amazons own ‘deals’ forum, or just Google ‘amazon delivery complaints’ – some of the review sites have threads running to two or three thousand (usually angry) posts. Amazon claim the deliver 97 percent of parcels on time, but there was a period in about 2011-12 where in my case they barely managed 40 percent on the appointed day, and those that did arrive looked like they’d been used as footballs. Considering I was getting 2 or sometimes 3 deliveries a week at times, usually small items, I’d think I was a decent representation of the average. The fact they’ve received so much negative publicity, including being given the full “Watchdog” treatment by the BBC, and have still made no effort at all to improve, suggests they prefer to believe their own PR rather than customer feedback. Given their dominance in online sales, perhaps it should be an issue for Trading Standards if they won’t change. I too have had problems with Amazon Logistics – they alleged that I was not in so sent the goods back to the seller – I live up a Bridle path & know when a vehicle is coming – no vehicle arrived that day & no card was left. – Get rid of this shoddy crowd. Customer service for Amazon were wonderful & arranged DPD to deliver the next day but this did not help me having to have another day off work. Still happening. Sad, as service used to be so good before “Amazon Logistics” appeared on the scene. I have had 4 AL deliveries in the last 4 or 5 weeks every one of which has required phone calls to customer services to sort out before final delivery. Excuses include tried to deliver, have delivered and couldn’t get access to the front door. Even when drivers have had our phone number and a detailed description of where our house is it has gone wrong. I am now unlikely to order from Amazon as a result, it is simply incompetent. Amazon Logistics managed to lose my package TWICE. I ordered a Lenovo G710 17″ Laptop and a Techair 17.3″ bag. I ordered these two items on September 5th and they were scheduled to both arrive 3 weeks ago. The laptop was delayed 2 weeks more, but they sent the laptop bag on-time. It showed as delivered on their site, but never arrived. I called Customer Service and sent a replacement just this week (which thankfully arrived). Also this week, my laptop was supposed to arrive. But, as the trend goes, it said “delivered” without a laptop ever reaching me. I called Amazon again and as of now, an investigation has been launched in finding the parcel and the person responsible for losing the package. I’ve called Amazon on several occasions (about 7 times in 48 hours) and they still don’t have a resolution to the problem. As you can imagine, I am very upset to find out that such an expensive device (that is supposed to be mine) is lost somewhere out there. Lies, damned lies, and APLE. Wonder which of the above stories best matches my experience? Too tired to find out. Probably better to cancel the order and source elsewhere. Nice find! Amazon Logistics are so far behind other couriers in terms of service and reliability that it will take them years to catch up. DPD were faultless in my area, with one-hour delivery slots and trackable vans. The Post Office were not far behind – and at least you knew when to expect the postie. This Logistics shower merely tell you that something is “Out for Delivery” and let you wait all day for something that may not arrive. And I thought Yodel was bad! Disgusting service and it WILL cost them business – and it will cost them one Amazon Prime member when I don’t renew next time. Just thought I’d add to the chorus. I’ve had multiple items failed at various stages of delivery. I have lost hundreds of pounds worth of bank and currency fees on the refunds to my account. I am HUNDREDS of pounds out of pocket thanks to this scandalously unreliable company. Look around the internet and you will find thousands of instances of this happening. Use Ebay instead, I implore you. TL;DR Amazon Logistics might as well be a SCAM. DO NOT USE. It’s still happening. We’re £260 out of pocket at the moment due to Amazon Logistics and Amazon UK. We were at home at the time Amazon Logistics (Jamie Stephenson is their UK MD now I believe if anyone is interested)) claim to have called and given our item (a tablet) to someone at our neighbours house. Our neighbours have lived there more than 40 years (they’re retired) and there has never been a person with the name given at their house. We have lived at our address for 18 years and never heard of anyone with that name in our street. We are on a corner of a road so only have the one neighbour. Amazon Logistics (under Jamie Stephenson’s leadership) claim to have a signature but Amazon UK refuse to give it to us. Amazon UK told us they weren’t interested in discussing the matter and said they wouldn’t discuss the matter unless we had a police crime report number. We called the police – they said as we could not provide them with evidence they could not raise a crime report but that it sounded as though Amazon (Amazon UK) may have evidence (signature, delivery scan, courier driver details, description of ‘neighbour’, etc) and so we should ask Amazon to report the crime and then they would investigate. They gave us a call reference rather than a crime reference. We contacted Amazon UK and gave them the call reference and asked them to contact the police and their response was “we will not be offering further insight” or corresponding on this matter”. I cant believe it. Jamie Stephenson should be ashamed that his organisation Amazon Logistics ‘service’ allows this to happen and Amazon UK should be ashamed at their attitude and approach. Amazon Logistics are unaccountable and it seems to me that their unwillingness to discuss the matter with the police could be because they are hiding criminality in their own organisation. Its disgraceful. Jamie Stephenson should be taken to task for it as should Amazon UK’s senior managers. You really ought to consider forwarding what you’ve described here to the likes of Radio 4s “You and yours” or some similar consumer complaints outlet in the media – I’d be amazed if there aren’t plenty of other similar complaints, and if they take an interest it might help, although clearly it won’t fix the appalling problem Amazon Logistics represents as a whole. Pretty sad really when such obvious criminality is just brushed off. Best of luck.